The graph depicts the cumulative number of students per year in each phase of the programme, together with the PhD completion and attrition rates as of December 2013. The completion rate accounts for the number of students that got the doctoral degree, while the attrition rate is the the number of students that abandoned the programme. The theses of the students that completed their PhD can be read or downloaded here. The distributions of publications and citations per student who got the PhD are depicted, as of November 2012. The light blue color indicates the publications resulting from the previous work of the students. The list of students that completed their theses can be found here and the publications in their individual pages here. 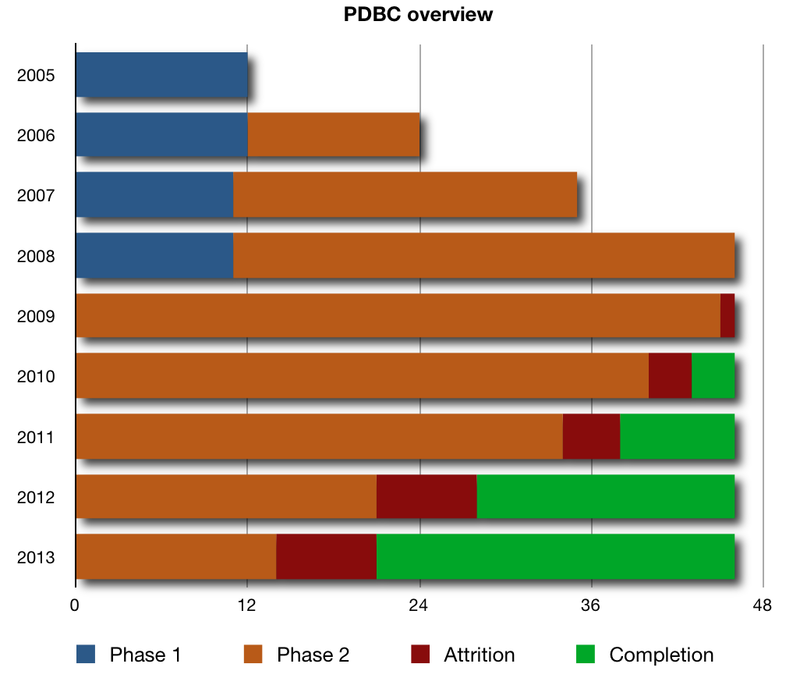 The distribution of the total PhD completion time since engagement in the PDBC in years is depicted, as of December 2012. The time to complete the actual research program can, on average, be inferred by subtracting the first year of courses from this total time. Notice that total completion times of 5 years or longer are a presently estimations based on increasingly small samples of the PhD candidate population. The list of students that completed their theses can be found here. 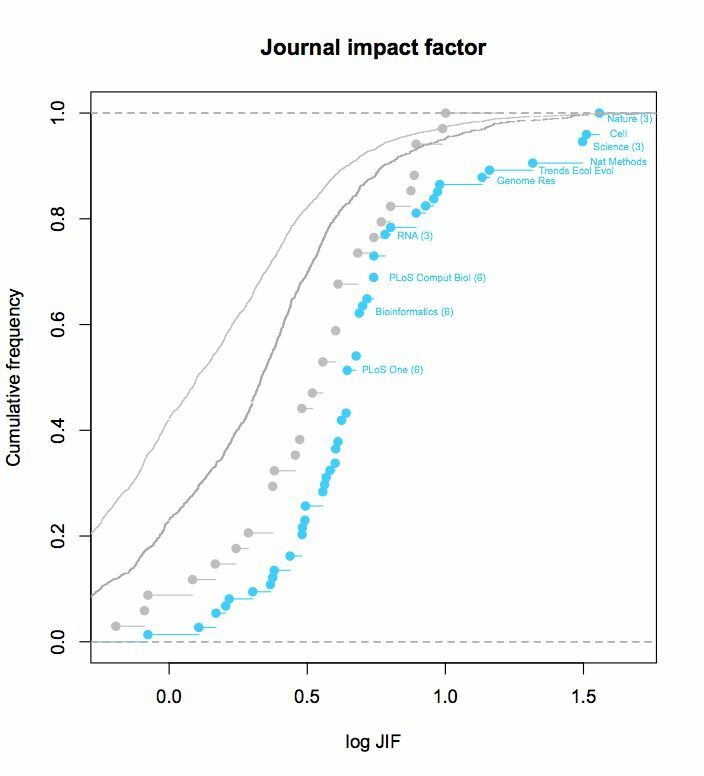 Cumulative frequency distribution of the journal impact factor (JIF) for the PDBC students' publications is displayed in the figure (light blue), as of November 2011. 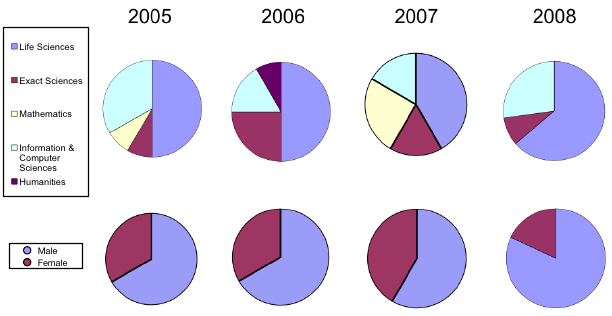 For comparison a similar distribution (gray) is included for the programme committee members when they were PhD students. The left most distributions in near-continuous lines are the overal distribution of JIF values in all fields (leftmost) and biological sciences. Some journal names are identified for reference. The number in brackets counts the number of multiple publications in the same journal. All the publications of the students are listed here. The PDBC offered 12 positions per year. The calls were open for a month. After some anguishing two weeks the number of applicants accumulated at an increasing pace. 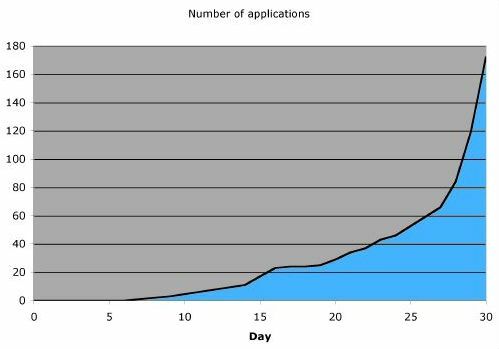 In the first edition of the PDBC we received a surprisingly high number of applications, above any initial expectation. This unexpected number of applications was perhaphs justified by a sinergy between several circumstances: the mediatism of the aggreement between three patrons - the state, a private foundation and a multinational company — to launch the PDBC; the coincidence of opening of the PDBC with the discontinuation of the Gulbenkian PhD Program in Biomedicine; the explicit encouragement of candidates with unusual academic record in our call for applications; and simply the novelty of the PDBC. In the next editions the number of candidates was in accordance with the expectations. The PDBC received applications initially from Portugal only, and in the two later years also from foreign countries. Candidates submitted their application online, providing a motivation letter, the CV and up to 5 referees and/or letters of recommendations. The information provided by each applicant was evaluated online by a pre-selection committee assembled from the members of the program committee. Each member of this committee classified the individual applications, and the best candidates were then interviewed in person or by phone by the selection committee. Although the candidates were individualy selected based on their motivation and record, an effort was made to compose groups balanced in terms of their basic training and profile.